1080i and 1080p are terms used for HDTV (High Definition Television) display which is also known as Full HD (1920x1080). 'i' in 1080i stands for Interlaced and 'p' in 1080p stands for Progressive scanning. 1080i video is "interlaced." 1080i video plays back at 60 frames per second, but that's a bit deceptive, because it's actually broadcast at 30 frames per second. The TV then displays those frames twice, in a way—the first pass is 1,920-by-540 for the even scan line field, and the second pass is 1,920-by-540 for the odd scan line field. The process by which this occurs is called interlacing. It contributes to a sense of motion and reduces perceived flicker. In 1080i each frame of video is sent or displayed in alternative fields. The fields in 1080i are composed of 540 rows of pixels or lines of pixels running from the top to the bottom of the screen, with the odd fields displayed first and the even fields displayed second. Together, both fields create a full frame, made up of all 1,080 pixel rows or lines, every 30th of a second. 1080p video is called "progressive scan." In this format, 1,920-by-1,080-pixel high-definition movies are progressively drawn line after line, so they're not interlaced. On paper, that may not seem like a huge deal. But in the real world, what you end up seeing looks sharper and more defined than 1080i, particularly during scenes with a lot of fast motion. 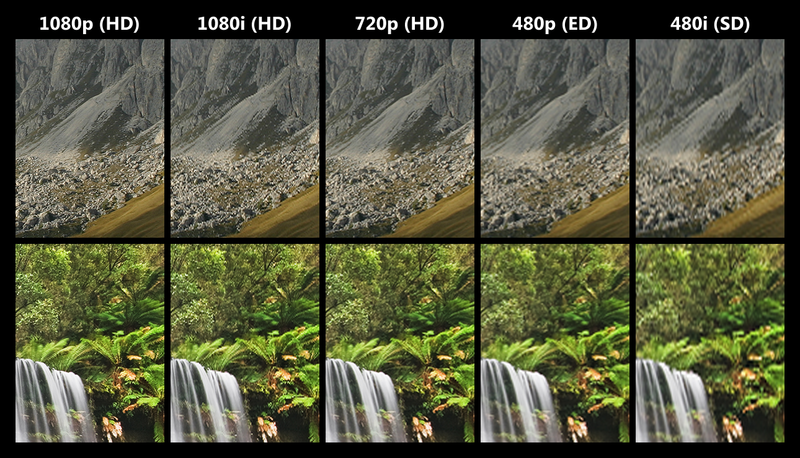 In 1080p, each frame of video is sent or displayed progressively. This means that both the odd and even fields (all 1,080 pixel rows or pixel lines) that make up the full frame are displayed together. This results in a smoother looking image, with less motion artifacts and jagged edges.